Johnson's Baby Products have been around for many years and is probably one of the top baby product companies out there when it comes to baby needs. 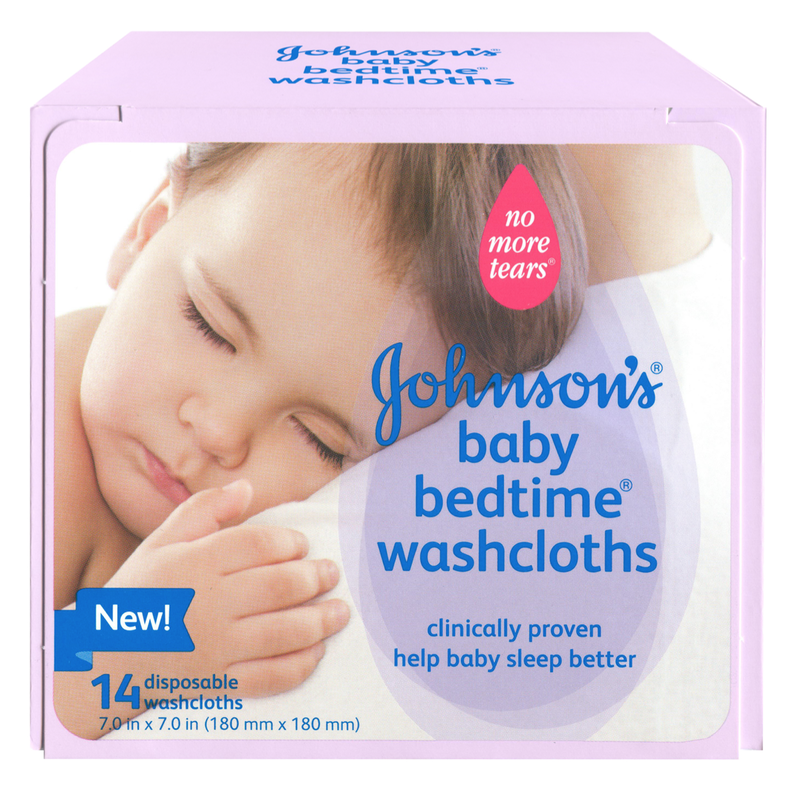 Johnson's has launched 4 new products geared towards soothing babies. Johnson's head to toe baby washcloths which already have the soap in the cloth, make washing baby so much easier. I know when washing my infants they weren't still and easy going... they would move all over and trying to get soap on them and wash them was a nightmare. This helped cut bath time in half! For restless nights they also now have bedtime washcloths which have a soothing lavender scent to them which puts baby in a nice relaxed slumber. Each pack comes with 14 disposable washcloths. I know that when traveling these made a great travel item, I didn't have to worry about an opened bottle spilling out and getting on my clothes, because I had no need to pack baby wash it was all on the disposable cloth. Some babies suffer from really dry skin causing cradle cap. Using Johnson's new Shea and Cocoa Butter Baby Oil helps relieve that. It also helps for giving your baby a soothing massage. Sarah doesn't suffer from dry skin but she loves to be pampered and the oil is a great way to bond with her and relax her for bed or naps. A Classic through and through, Johnson's Baby Powder a must have in all diapers bags. Great scent and soothes babies bottom. You can even purchase this in travel size at most all retail stores its that much of a classic. Its a brand my mother trusted on me and now I trust on my kids and one day my kids will use on their children. My favorite is the Bedtime Lavender Lotion oh it smells so good and nothing makes you wanna cuddle up and sleep better then a soothing lotion. The lavender is not a over powering scent its a nice sweet scent that helps to relax and place baby in a great night sleep. It applies smoothly and leaves no wet sticky mess. A truly great addition to any bed time routine. Creamy Oil With Coco and Shea Butter, I love coco butter something about it just seems to warm the soul. Its relaxing and makes for super soft skin know matter who you are. This is a great product to sooth and relax baby with a nice rub down of legs and arms which keeps baby super huggable. Last we have Johnson's Baby creamy oil with aloe vera, and vitamin e. What I love about this is I get the same effect as the baby oil only I am not a oily mess when I am done. It absorbs nicely into my hands making them soft and smooth like my babies body. Check out all the great baby products Johnson's has to offer here. Disclosure: I was given the 7 Johnson's Baby Products to help with my review. All opinions are 100% mine. I like the baby powder. We like the Johnsons Baby Shampoo. My favorite Johnson's baby product is the baby oil. I use it every day. I love Johnsons baby powder! I love the original Baby Lotion. I like the head to toe wash ! Love the Lavender Bedtime Lotion! I love the baby powder. I love their conditioning shampoo, it's like a 2-in-1 and my son has super curly hair so it gets tangled constantly and this stuff takes all of the tangles out and it smells great too. My favorite is No More Tangles spray. I enjoy the Johnson's and Johnson's Creamy Baby Oil. I love their original Baby Shampoo. I use it on my hair. My highlights last longer and I rarely have split ends. I love Johnson's bedtime bath lotion! I love the smell of Johnson's Baby Lotion. Love Johnsons Original Baby Wash. I love their Lavender Bedtime Bath Wash.
Nice you can also try good Baby Products PAMPERS New Baby Nappies?